The great achievement of David Cronenberg’s Naked Lunch is that it proves an adaptation need not be faithful to the original text to be successful. Of course, in this instance a straightforward adaptation would be all but impossible as William S. Burroughs’ hallucinogenic novel is one of the most infamously unfilmmable books. Instead, Cronenberg cleverly combines elements of the novel with pieces from Burroughs’ more straightforward work, as well as events from the author’s real life, to construct a feature that captures the essence of Naked Lunch, if not the literal plot. By doing so, Cronenberg does the viewer a service by making the achievement of reading the original novel neither hindrance nor asset. However, possessing a little familiarity with Burroughs’ biography certainly helps with navigating the picture. Knowing that Burroughs did in fact kill his wife Joan in a failed William Tell routine, that he spent time in Tangier with Jane and Paul Bowles, that he was bisexual and often conflicted about his attraction to men, and that other Beat Generation authors Jack Kerouac and Allen Ginsberg helped wade through his disparate typings to construct his most celebrated work, does inform and deepen one’s viewing experience. The film is plenty impenetrable as it is, going in completely cold could be suicide. While cutting to the core of Burroughs’ life and art, Cronenberg still manages to turn it all into a thoroughly Cronenbergian picture. 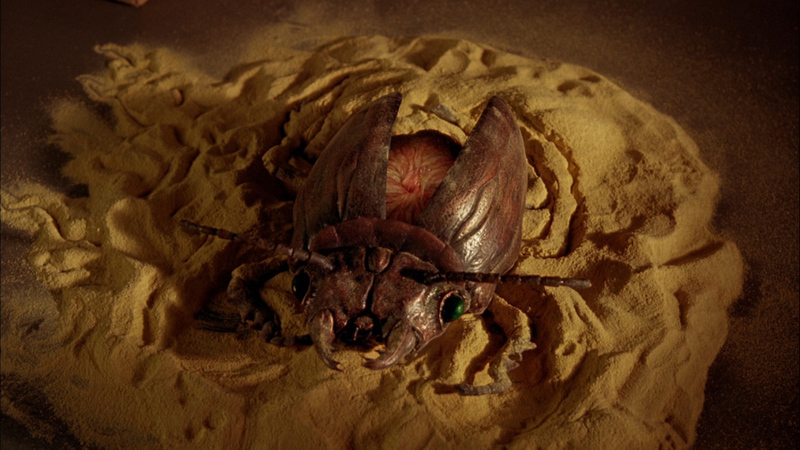 There are gooey, gory creatures who writhe and pulsate onscreen. The descent of Peter Weller’s protagonist, William Lee, into a terrifying alternate reality recalls a similar journey made by James Woods in Videodrome. But beyond the scope of Cronenberg’s work, the movie shares many similarities with another film released the same year. 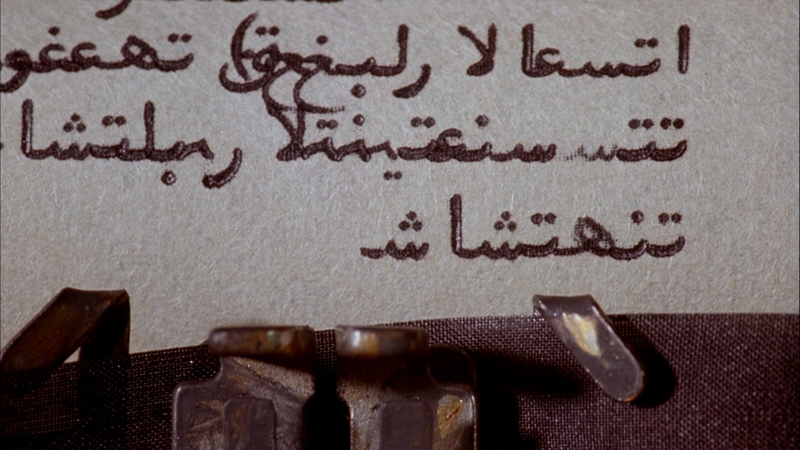 Naked Lunch begins where Barton Fink‘s nightmare ends. The films work as a pair in so many ways it is downright eerie. They were both released in 1991 and star Judy Davis, whose characters both die gruesomely, sending their respective protagonists off into the depths of their psyches. While the films are set a decade apart, the Coen Brothers’ Fink in 1941, Lunch in 1958, the production designs often evoke the other’s mood. 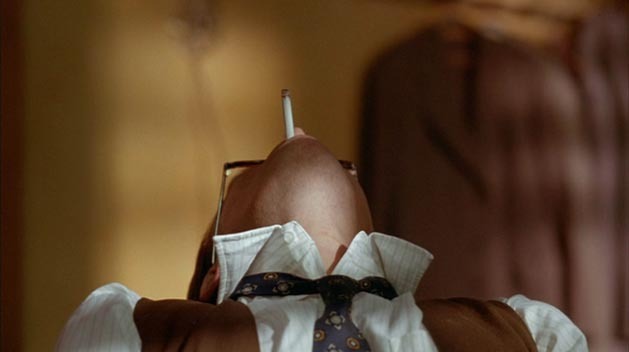 Weller is seen breathing heavily onto a bug clinging to a wall, the peeling wallpaper of which recalls the first signs of unease in Fink’s hotel tomb. The iconic hallway of Fink’s hotel seems like it is just around the corner from Tom and Joan’s Tangier apartment. 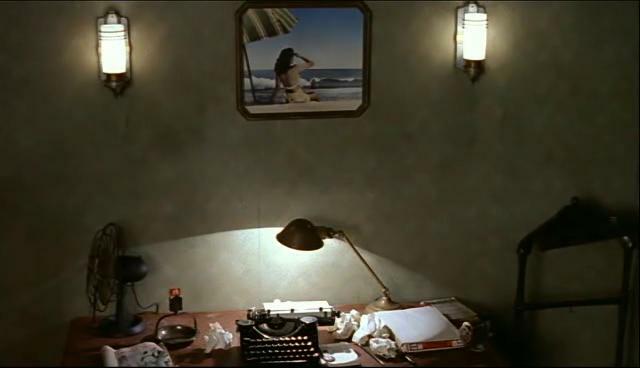 On the whole, Barton Fink is the more successful film, one that shocks more because it shocks less. There is a pummeling quality to Naked Lunch that is difficult to evade. 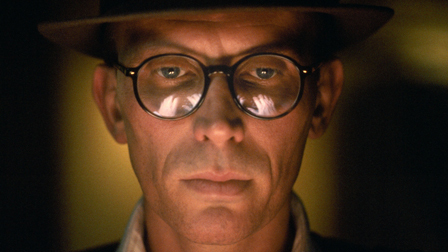 The film works well as a portrait of an artist, a junkie, and a man consumed by grief. But it spends too much time in the Interzone between emotion and excitement. William Lee remarks to his wife at the beginning of the film, “I thought you were done doing weird stuff”, to which she replies, “I thought I was too, but I guess I’m not.” Take that as you will.